I was born on September 15, 1957 and from an early age showed an interest in the physical sciences. This photo was taken in 1960. 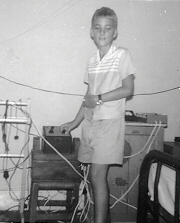 In my pre-teen years, I wired extension speakers to the gramaphone, set up flashing lights and toy electric trains. Here I am holding a vacuum diode, in the background is a multi-tap transformer with rheostats and reversing switches... In the box, is a long compression-type disc selenium rectifier.... ammeter and voltmeter are visible on top of the cabinet. The apparatus shown provided variable sources of a.c. and d.c. for my experiments. This photo was taken in 1967. Back to Homepage. Past Memories. Electronics. Education.